We started our hike from the Red Box picnic area on the Gabrielino Trail East by going down down these steep stone steps. The morning sunshine made for beautiful light. The trail becomes exposed for a short distance, but that doesn’t last very long. Soon we dipped down into the canyon underneath the shaded oaks. We passed a sign to let us know we were heading in the right direction to Valley Forge Trail camp. Parts of the trail were full of lush green vegetation. We stopped for a moment to listen to soft, peaceful chirping of the crickets. “G” marks the Gabrielino Trail. We came upon some cabins. All of them seemed to be in good condition. From what I understand, this one was once used by the Long Beach School District to give the kids a taste of the outdoors. Remains of an old chimney. Not sure what the story is on this, but I’ve made note to do some more research. This cabin looked like the door was propped open, but there didn’t seem to be anyone around. We did not explore out of respect for whoever owns the cabin, but it sure was tempting to want to go in and take a peek. 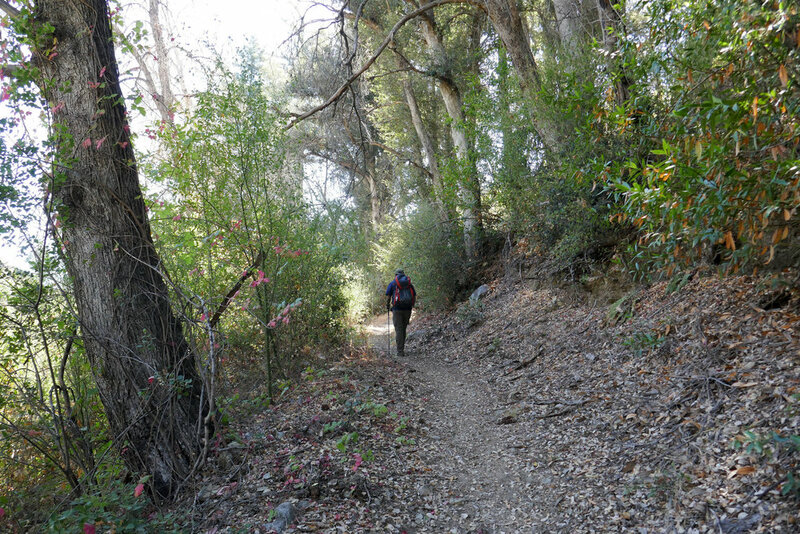 We soon arrived at the junction where you can take a spur down to Valley Forge Trail Camp, or continue along the Gabrielino Trail to West Fork and Devore Trail Camps. We chose to save that trip for another day, as the weather was still a bit too warm and I don’t like hiking in the heat. It was also quite buggy so we both used our fly nets which work wonders! Heading into the Valley Forge Trail Camp. There are restrooms here, picnic tables and fire pits. I walked around the camp a bit to explore the area and found this bridge. After consulting my map, I learned that this trail would take us all the way up to Eaton Saddle. The camp was very quiet today — I’d like to come here and stay overnight sometime. We picked a spot to relax and make breakfast. 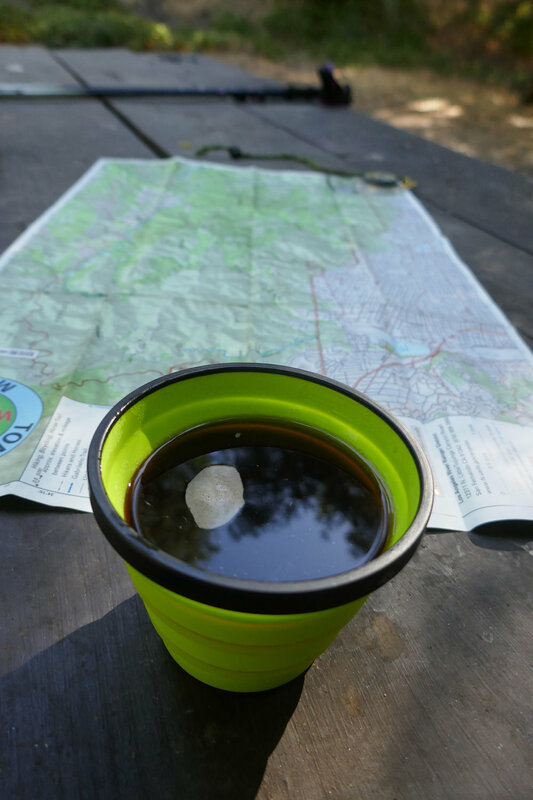 Coffee always tastes so good out on the trail! This Steller’s Jay invited himself to the table. After a good long rest, we started heading back. The weather was warm as it usually is in September, but the sunlight and the fallen leaves made it feel like autumn. There was lots of shade to enjoy along the way. Almost back to Red Box. Climbing out of the canyon, we took in the views of Cucamonga Peak, Pine Mountain and Mount San Antonio. Back into the sun for a short time. The final ascent up the stone steps. It was a wonderful day as usual!